Meadow knapweed is native to Europe and was planted in Quebec during the late 1800s to attract honeybees. This knapweed can invade grasslands and out-compete important vegetation which reduces the value of pastures, hayfields, and rangeland. 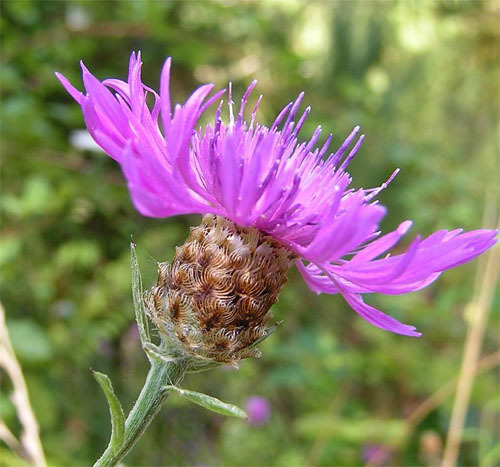 Meadow knapweed is a hybrid of brown knapweed and black knapweed and, as such, shares characteristics of both parent species. Hybrids are highly variable in appearance. Therefore, several characteristics need to be considered for a clear identification. The flowers usually have large peripheral petals. The bracts are variable in colour but usually have hair-like margins. The leaves are green, lance-shaped or shallowly lobed, and become progressively smaller as you go up the stem. Meadow knapweed grows up to 150 cm tall.